Another SCG Regionals is in the books, and SCG Con is just days away. It’s an exciting time to be a Modern player, or at least a Modern data hound. Today, we’ll look at some of the cooler lists from Regionals, and I’ll give my thoughts both on the recent success of Colorless Eldrazi Stompy and the upcoming Invitational. My previous Regionals coverage articles focused on the wealth of creative deckbuilding routinely on display at these events. But whether tournament-goers felt like playing it safe this year or Modern’s just more solved than usual, this batch of Top 8 lists offers little in the way of eyebrow raises. Still, a few lists did impress me. 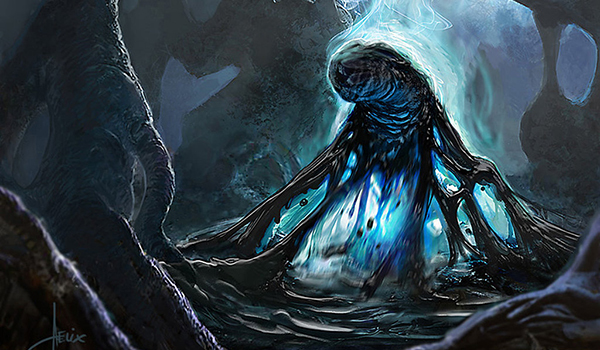 Modern players and pundits alike have unendingly clamored for Sultai Rock to be viable since the format’s baptism. Instead, the shard has continued to show up once a year or two in some incarnation and then fall back off. Well, that’s still happening! This deck isn’t just BG Rock deck with a minor blue splash. Rather, Sultai Rock takes after Jund, and comes complete with functional analogs to the midrange poster-boy’s own cards. Snapcaster Mage provides tempo and value in the mid-game, like Bloodbraid Elf; Fatal Push fills in for Bolt; Jace, the Mind Sculptor cuts into Liliana shares; Creeping Tar Pit trades raw closing power for evasion over Raging Ravine. The biggest changes from Jund, then, are consistency-related. Trading Elf for Snap removes Jund’s randomness element from the picture entirely, instead giving pilots a sort of mid-game toolbox based on the spells they’ve seen so far. And they’ve seen plenty thanks to the full set of Serum Visions, a card I think Jund has always secretly wanted to play—whether its pilots know it or not. Visions represents the most efficient and splashable card filtering in Modern, and in my eyes gives Sultai an edge over Jund more than any other card here. To be clear, I don’t think this deck will disappear again because of some arbitrary vendetta against Sultai. I think it will disappear again because of the state of BGx in general. The super-archetype is currently too fair for Modern, and needs some way to cheat on mana as do the other aggro decks—right now, Bloodbraid Elf is the closest it gets. Tarmogoyf‘s days as format watchdog are numbered not just because of Fatal Push, but because many other decks now have access to archetype-specific Goyfs—Hollow One, Gurmag Angler and Thought-Knot Seer, to name a few. BGx decks now stretch themselves thin covering all the bases while also fending off larger creatures. Who could have guessed we’d one day see a build of UR Prowess where Soul-Scar Mage was actually better than Monastery Swiftspear a good chunk of the time? Mage owes its five minutes of fame to Dominaria newcomer Wizard’s Lightning, which lets UR Wizards double up on Bolts—or, with Snapcaster in the picture, triple up. In my own recent experiments with Wizards, I tried integrating both Wizard’s Lightning and Wizard’s Retort, and was impressed with both cards. It goes without saying, though, that Lightning is the better of the two, and it also happens to be a card that slots admirably into UR Prowess. Harlan slyly chooses to ramp up the Faithless Lootings without reaching into Bedlam Reveler, understanding that Prowess requires high levels of velocity to function. While Reveler’s a fine late-game plan for the deck and an attractive option against midrange, Snapcaster Mage is much more flexible, and stronger in the face of graveyard hate. Its added synergy as a Wizard makes it the clear favorite for this deck. Notably, Harlan’s build omits Vapor Snag entirely. I can imagine he doesn’t want to sit down in front of a Tarmogoyf, but with Goyf on the decline, cutting the blue instant is brilliant. Besides, all those burn spells and Soul-Scar Mage at least ensure the deck isn’t just auto-dead to a green guy. Blue Moon enjoyed quite a showing last weekend, with multiple builds rearing their heads. But Dave Shiels’s version takes the cake as the most intriguing. He favors a full set of Opt over Serum Visions… and splashes black for a control-crushing recursion package. There’s more black stuff in the side. Dreadbore teams up with Cast Down to take care of nasty creatures, while Collective Brutality gives the deck some much-needed points against spell-at-premium aggro-combo decks like Company and Burn. But I’m still struggling to understand Cast Down at all—why not Terminate? Isn’t it fun to kill Thalia, Guardian of Thraben sometimes? Or Baral? Or, like, Shalai? Cast Down is a cleaner turn two play after leading off an Island, but with just a single copy in the mainboard, I don’t see that coming up more often than the extra utility from Terminate. Those nitpicks skirt the point of this build, though, which is to annihilate attrition decks. 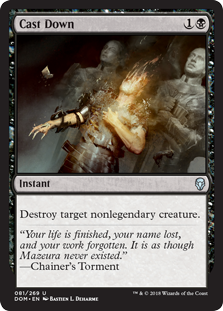 Discarding Keranos, God of Storms with Thoughtseize does very little thanks to Kolaghan’s Command, and when the God sticks against something like Jeskai or Jund, he all but ends the game. Brutality is an excellent sideboard pick for such a strategy, since it offsets the clunkiness of three colors and God cards by functionally generating mana with its escalate cost. I also attended Regionals, but you won’t see my name in the Top 8 lists. While I may have limped out of my first Competitive REL event since the Worcester Classic at an ignominious 3-3, my deck had an excellent weekend. In fact, Colorless Eldrazi Stompy was the most-represented Eldrazi deck in the combined Regionals Top 8 metagame, boasting three copies to the two each from BW and Tron. No real surprises there, at least not to me—sure, I’ve got all the bias in the world, but Stompy’s also been racking up 5-0s with impressive steadiness ever since my Classic win. The numbers from last weekend speak further to its viability in this metagame, especially since it remains relatively fringe. That’s the exact list I played at Regionals, but with a second Spyglass over a Gut Shot. Shot has been phenomenal against Humans (the deck I perceived as Level 0 last weekend), but I’m more concerned with beating Jeskai right now (the Level 1). The deck gains tons of staying power with Teferi, Hero of Dominaria and Search for Azcanta in the picture, and Elspeth, Sun’s Champion has always and continues to end the game for us on the spot. Spyglass is also great against Tron, which I expect to show up in some counterspell-hosing configuration to combat Jeskai (the new Level 0) and especially Mardu (the new Level 1 that also beats Humans, and the deck I pegged as the savviest choice in Acton for that reason). I doubt Mardu is quite as good at the Invitational, since players will have it in their crosshairs after Regionals. Speaking of Humans, I shaved the fourth Blinkmoth to accommodate a second Copter as a hedge in that matchup. Zhalfirin Void helps us make land drops in-game if we need them, but until recently, I haven’t had anything I wanted to play over one of our lands. Copter’s utility against planeswalkers and the random combo decks showing up in Modern (including Valakut) made me eager to try another one. So far, it hasn’t disappointed, and powering out the vehicle on turn one makes early mana decisions very challenging for opponents slinging kill spells. As SCG Con approaches, I’m increasingly noticing buzz surrounding the No Banned List Modern Open or various Pauper tournaments. But my eyes are fixed squarely on the Invitational itself as I excitedly await the inevitable new Modern developments. How do you think the tournament will shake out? Bit confused as to the role of Copter here. When is the card BAD then ? And how do you use it – your previous information on it seems quite out dated now. For me, the card has failed to impress in every non – jund matchup. Copter gives our creatures pseudo-haste by allowing them to crew it the turn they come in. It’s awful against highly aggressive decks that force us to block each turn, like Burn and Zoo; there, we want to leave that new creature back to block anyway. It’s also bad post-board vs. one-drop removal decks (Push, Bolt, etc.) where we board out Chalice (i.e. Mardu, Jund), but tends to be pretty good game 1 against the field at large. It also helps us mulligan by improving hands without fast mana (i.e. T1 Dismember, T2 Copter, T3 Scourge). Everything else I’ve written about the good Copter does in this deck still stands. So you board it out against jund or Mardu? Right now it seems that tier 1 decks are 6 decks not so interactive (Humans, Tron, Burn, Hollow, KCI, Affinity) and 2 interactive (Jeskai control and Mardu): time to resleeve a 2-2 Reshaper-Endless One split?